Nothing completes a celebration like a high school graduation cake. We create various types of cakes for New York graduates, all designed to your specifications. This particular cake is a custom two tiered graduation cake made with a chocolate sponge cake and our special peanut butter filling. 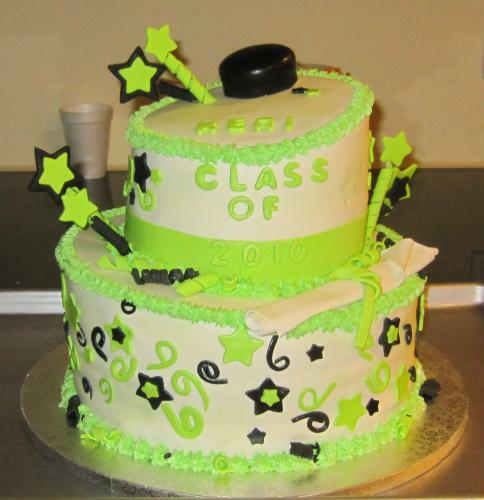 This amazing cake is covered in our vanilla fondant and decorated to match the high school colors. The customer wanted a special cake to celebrate their graduation and their acceptance into a top rated college in New York City. We can also create other types of graduations cakes. Other cakes include nursing graduation cakes, college graduation cakes and even preschool cakes. And remember that we can replicate or custom design any cake that you like. Feel free to look around the website and examine all the cool cakes that we've created. Order your next cake creation from Land of Cakes New York.